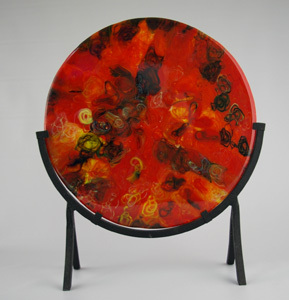 This very unique piece of glass is created in our kiln at 1760 degrees. The 1250 grams of glass are stacked on some wire and placed in the kiln about 8″ off the kiln floor. When the glass melts at this high temperature it flows between the wire squares and creates amazing patterns as it drips, like honey, to the floor of the kiln. We never know what to expect when we open the kiln the next day.